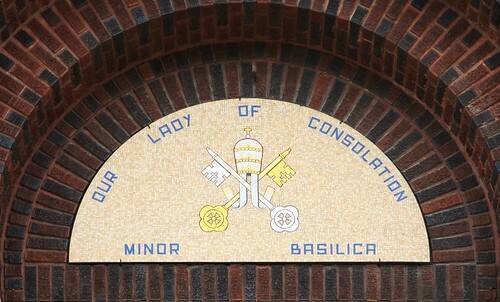 Our first official basilica visit was to the Basilica and Shrine of Our Lady of Consolation in Carey, Ohio on August 17, 2010. I really like the angels they had flanking the entrance to the basilica. I suppose I haven’t been to many churches (yet!) 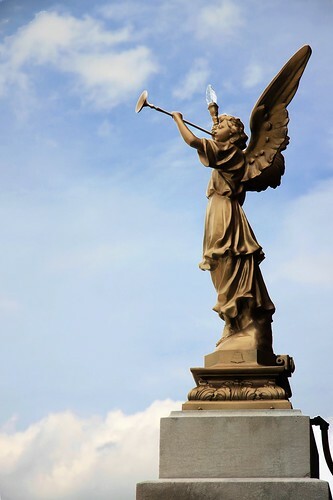 but I have always associated angel statues on the exterior of a church with a Mormon church. The basilica ends up encompassing quite a bit of land; in addition to the church, there’s a Franciscan monastery attached to the rear of the church, a TEC building, a small garden area with a large plot of land attached (I suspect that this belongs to the church), a guest house, and a former school turned administrative building, and that’s just on this one side of the road! There’s the original church across the street, as well as a cafeteria and gift shop. Down the road some (past some neighborhoods) is a drivable Stations of the Cross. You can see a rough layout of the grounds below. 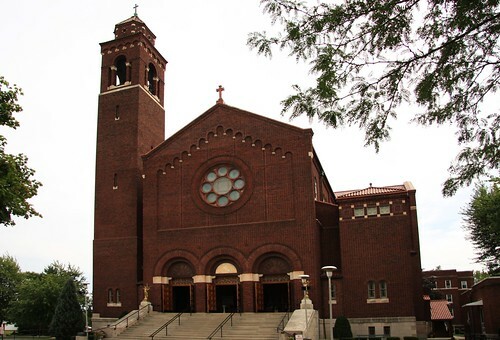 The parish of Our Lady of Consolation was founded in 1868. 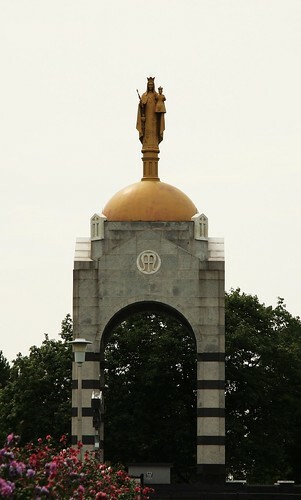 Our Lady’s statue was brought from Luxemburg in 1875. On the day it was transported from Burwick, Ohio to Carey in solemn procession, Our Lady gave her first sign of approval for the new shrine. Although the area was undergoing a heavy rainstorm, the procession was untouched. Rain drenched Carey immediately after the image was taken into the church. Pope Leo XIII established the confraternity of Our Lady of Consolation in 1879. The Conventional Franciscan Friars have been serving the shrine and the pilgrims since 1912. As the years have passed, Mary has blessed Carey and thousands of visiting pilgrims with many spiritual and physical favors. The Conventional Franciscan Friars welcome you to Mary’s shrine and trust they may be of service to you. My boyfriend and I decided to start with the most air conditioned place first: the gift shop. As far as gift shops go, it seemed to be a decent size, and filled with your typical Catholic fare: rosaries, crucifixes, and the like. The photo below is from just outside of the gift shop. 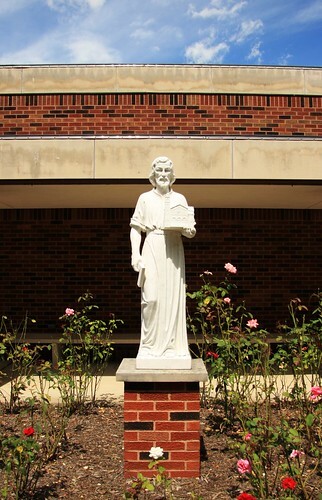 The building is named for St Joseph, hence his statue out front. I’ve never seen a likeness of him holding a church. Nevertheless, I found it pretty cool that they replicated the basilica for him to hold. 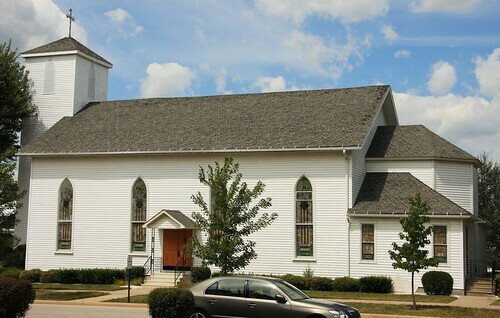 Next up was the original church from 1867. 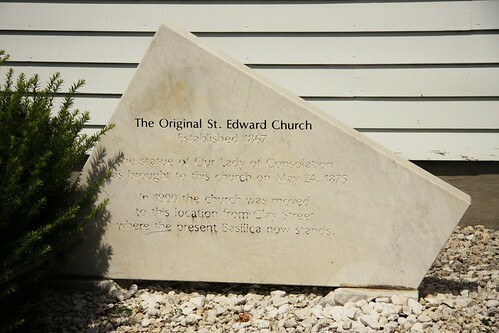 Initially, the church was called St Edward’s, but throughout it’s construction, the parishioners prayed to Mary under the title of Our Lady of Consolation. When the church was completed, they renamed it in her honor. This church is now used for Euchristic Adoration, probably perpetual, although I didn’t ask. My boyfriend and I were talking about it, and we suspect that the friars use this church to celebrate Mass and whatnot when the basilica is probably in use by pilgrims. It was pretty empty when we went; there was one woman who was keeping company and another man had entered just ahead of us. We spent some time praying, and the woman came over and told us about two things: the Shrine Park (where the Stations of the Cross are), and the basement of the basilica, where tokens or petitions from pilgrims are left. I didn’t get any pictures of the interior of the church – seemed inappropriate during Adoration. 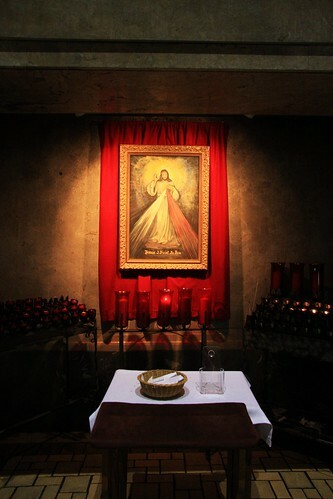 Nevertheless, it was a very beautiful, simple chapel. Next, we went across the street to the small garden area behind and between the basilica and the guest house. 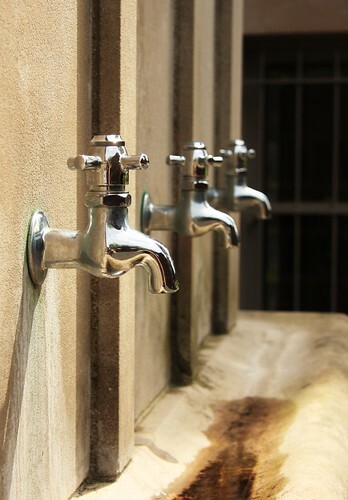 Right next to the basilica is holy water on tap, which I thought was pretty cool, or at least the set up was. 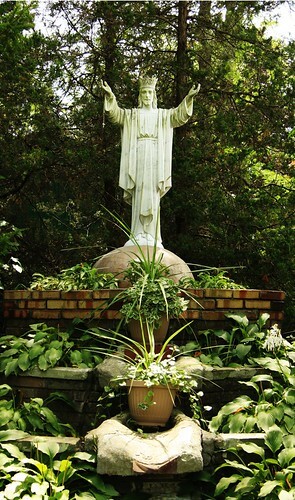 The foremost part of the garden had a few statues of St Francis of Assisi and Mary. 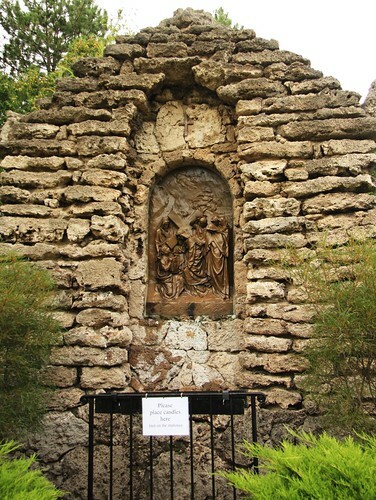 Further back was a more secluded statue of Our Lady with the Christ Child, and past them was a Christ the King statue in a little grotto. The grotto had a paved area next to it and small shed with a cross on it. This area faced out into what was easily two football fields worth of grassy area. We suspect that outdoor Mass is celebrated in this area for larger festivities. This basilica is quite the pilgrimage for many of the faithful, with many people coming from as far as the Middle East! The woman in the Adoration chapel told us that there were thousands that showed up for the feast of the Assumption of Mary, which is typically held on August 15th. Astute readers will notice we were two days late! I had read online that it was a popular feast at this basilica, but I had no idea as to the magnitude. Aside from celebrating Mass on the actual feast day, there is a festival and procession on the preceding day as well. We’ll definitely have to make it back out here at some point to celebrate! Inside the basilica is gorgeous. 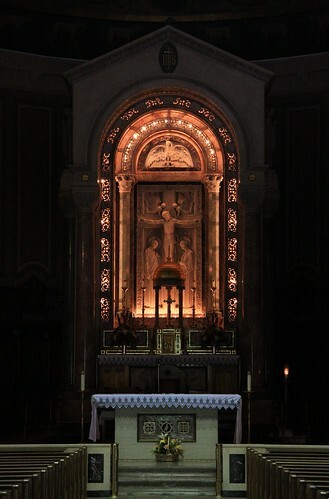 Many of the lights were off, so my pictures of the altar from the back are a bit grainy. I’d recommend looking at the photo albums the basilica also hosts. 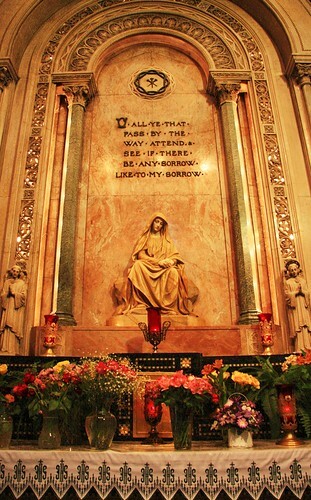 The altar is done pre-Vatican II style, even though the basilica was renovated post-Vatican II. There are two shrines on either side of the altar. 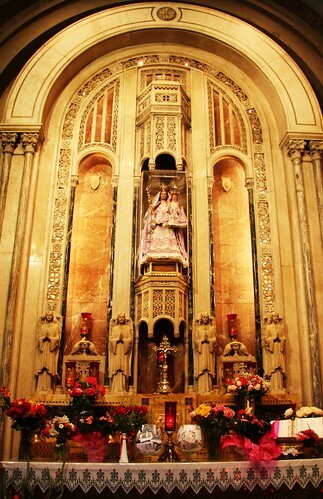 On the left (if you’re facing the altar), there is a small shrine to the image of the Divine Mercy on the side of the basilica, and then a shrine to the Virgin Mary just to the left of the altar. O all ye that pass by the way attend & see if there be any sorrow like to my sorrow. 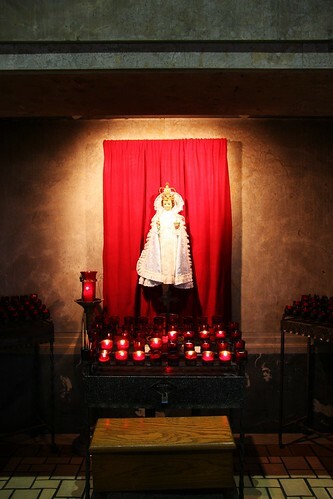 To the right of the altar is a small shrine to the Infant Jesus of Prague and then the shrine to Our Lady of Consolation. This is the statue which was imported from Luxembourg and carried into town, referenced earlier in this post. Here is a close up of Our Lady and her Son. Many people have sewn outfits for her and Jesus, either as part of a partition or as an act of gratitude. 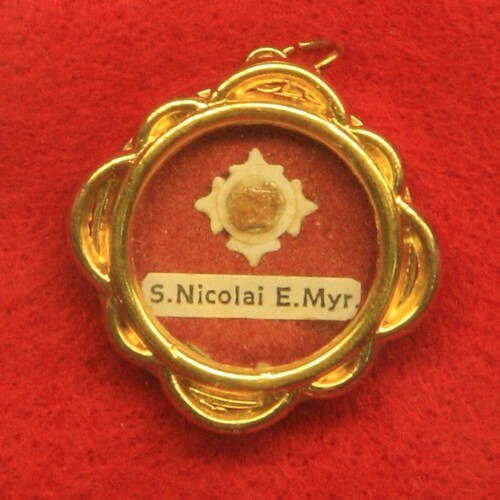 They are kept on display in the lower basilica, and they do change the outfits. 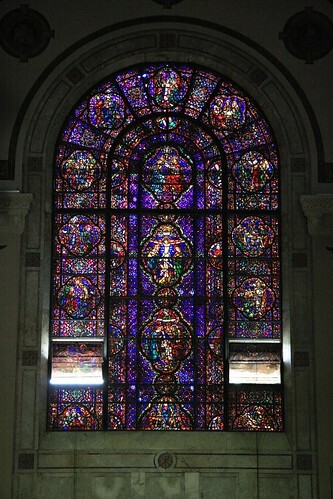 It looked like they were doing some repair work on one of the massive stained glass windows, but the other was intact. There’s also a lower basilica, which houses a number of relics and mementos from past pilgrims. On the left side of the lower basilica is a small shrine of various relics – well over 200, many of which are first class. 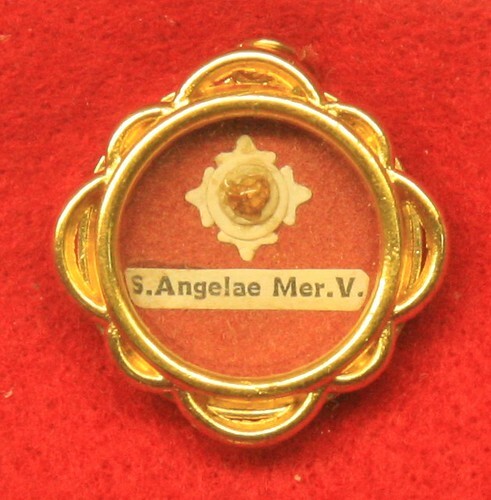 I found one for my confirmation saint, Saint Angela Merici. My boyfriend’s is Saint Nicholas. The right side of the lower basilica had a display case showing off all of the dresses available for the statue of Our Lady of Consolation. Next to it are tokens and petitions of pilgrims. I wish I had thought to taken a picture of these, but I was too busy reading them all and completely spaced. There were notes from people and families that had been faced with serious illnesses that had either been overcome, or they were petitioning others for prayers. There were photos of those who had come before us seeking help from Our Lady. There were all sorts of crutches, canes, and braces left by those who had been healed. It was amazing. 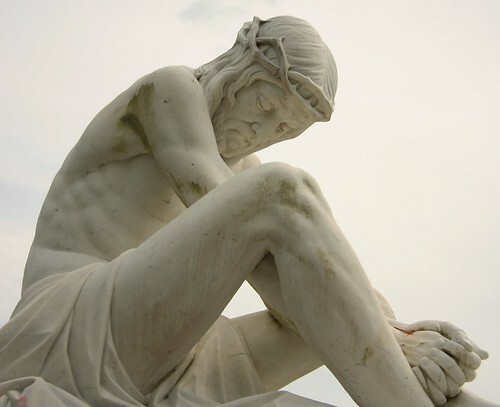 Separate from all of this is the Stations of the Cross down in the Shrine Park. The stations wound around the outside of the park. The interior was mostly with grassy with the occasional statue of Christ or a saint. The middle contained and altar, complete with Our Lady of Consolation on top of the ciborium (the canopy over the altar). 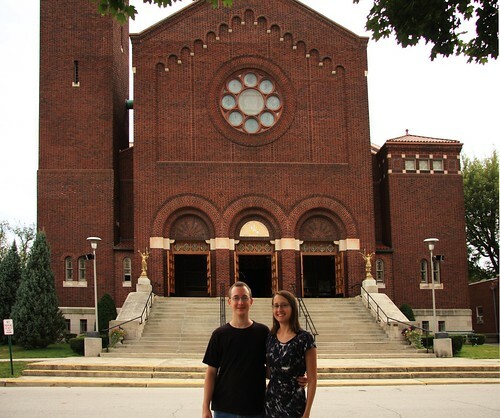 Finally, my boyfriend and I have decided that we need to get a picture in front of each basilica to really make it count and have proof that we visited. Very neat blog and gorgeous pics!! Maybe I can “travel” to all these basilicas vicariously through you!! Your pictures really tell a story! Anyway, found your blog through your comment on Little Catholic Bubble 🙂 Look forward to following your journey! What an ambitious goal! You’ve done a beautiful job with your first one. Looking forward to seeing more!